From the "When Trainwrecks Collide!" File... apparently, 90 Day Fiance alum Evelyn Cormier is setting her sights on American Idol. The 19-year-old television personality and aspiring singer impressed Katy Perry and the other judges with her cover of the Chris Isaak song "Wicked Games" during Sunday's episode. "Literally, one of my favorite voices I've ever heard in my life," Perry gushed after Cormier's rendition. "I think when you have a really amazing band behind you, it's going to be something crazy," Luke Bryan said. "You have a sound. You have a sound that's yours," Lionel Richie added. "I don't know what you're doing. But whatever it is... it's an identity. It's absolutely an amazing identity." Cormier got a "yes" from all three judges and celebrated the achievement in an Instagram post Sunday. "So thankful and beyond grateful! Thank you @katyperry @lionelrichie @lukebryan I'm going to Hollywood!!! #thenextidol #americanidol," she captioned a photo of herself with her golden ticket. Cormier is known for appearing in 90 Day Fiance Season 5 during her engagement to David Vazquez Zermeno. The couple married in October 2017. Cormier announced on Instagram in December she auditioned for American Idol. She released the EP Ghost in April 2017, which includes the songs "Champagne" and "Kind Eyes." Do you watch either program...on purpose? Bachelor and Bachelorette host Chris Harrison returned to the signature mansion where the reality shows are filmed after it was damaged during last fall's California wildfires. "She's never looked so gorgeous. After what our community has been through this year I'm more grateful than ever to be back home #TheBachelorette #BachelorMansion," Harrison posted on Instagram on Sunday alongside a front facing photo of the property. The Bachelor mansion, which is set to be featured prominently during Season 15 of The Bachelorette, starring Hannah Brown, suffered damage in November after the Woolsey wildfire entered the city of Agoura Hills. A building on the estate used as the production headquarters for The Bachelor and Bachelorette was destroyed. Season 23 of The Bachelor, which recently wrapped up with Colton Underwood entering into a relationship with Cassie Randolph, was not affected by the wildfire. Production had finished filming at the location before the wildfire arrived as Season 23 moved onto other locations around the world. "We're getting to know the deep dark things about each other. The Bachelor is like reverse dating. We're learning the little things ... We also both like to throw a bunch of random ingredients in a bowl and call it dinner." Which NYPD Blue alum was cast as Deathstroke in Season 2 of DC's 'Titans'? Game of Thrones will end with a 1 hour, 20 minute episode. Episode 3, which airs April 28, will be the longest of the season at 1 hour, 22 minutes. Episode 4 airs May 5 and will run 1 hour, 18 minutes, with Episode 5 following May 12 at 1 hour, 20 minutes. Game of Thrones stars Emilia Clarke as Daenerys Targaryen, Kit Harington as Jon Snow, Lena Headey as Cersei Lannister and Sophie Turner as Sansa Stark. The series released a first Season 8 trailer featuring the characters last week. Season 8 will show Dany and Jon arrive at Winterfell, where Jon left Sansa in charge in his absence. Clarke said in a new interview with Harper's Bazaar that Dany meeting Sansa was an "exhilarating" experience. Game of Thrones is based on the A Song of Ice and Fire book series by George R.R. Martin. Leonardo DiCaprio and Brad Pitt go old school in the first poster for director Quentin Tarantino's next film, Once Upon a Time in Hollywood. 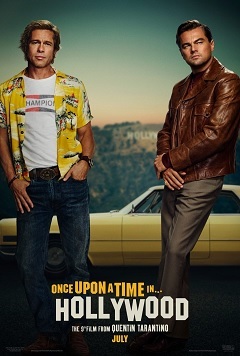 The poster, released on Monday, feature the pair posing together in front of a yellow car and California's Hollywood sign. DiCaprio and Pitt are wearing 1960s clothing as the film is set during the Manson Family murders which took place in 1969. DiCaprio is set to portray fictional fading television star Rick Dalton with Pitt as his stunt double Cliff Booth. Margot Robbie will star as late, real-life actress Sharon Tate who's character will be living next door to Dalton. Tate was one the victims of the Manson Family. Dakota Fanning stars as Manson Family associate Lynette 'Squeaky' Fromme and Damian Lewis stars as actor Steve McQueen. Al Pacino, Emile Hirsch, Timothy Olyphant, James Marsden and Tim Roth are also set to star. Once Upon a Time in Hollywood, the ninth film from Tarantino, is set to arrive in theaters on July 26. Esai Morales will be starring on Season 2 of Titans as major DC Comics villain Deathstroke. Titans, a live-action drama that follows the characters of DC's Teen Titans, appears exclusively on the comic giant's streaming service, DC Universe. Robin (Brenton Thwaites), Starfire (Anna Diop), Raven (Teagan Croft) Beast Boy (Ryan Potter), Hawk (Alan Ritchson) and Dove (Minka Kelly) star on the series which premiered in September and finished its first season in December. A premiere date for Season 2 has not been announced. Deathstroke, aka Slade Wilson and also nicknamed The Terminator, was created by Marv Wolfman and George Perez in 1980. He is known for taking on the Teen Titans and hunting down heroes for the right price. Deathstroke possesses incredible strength, reflexes, and a brilliant tactical mind. "Slade Wilson is known for being DC's deadliest assassin. While serving his country, Slade became an elite soldier before government testing enhanced his physiology to near superhuman levels, putting him on a path of darkness and revenge," reads Titans' official description of the character. "To his family, Slade is a father and husband, but to the rest of the world, he is feared by many as the infamous Deathstroke; selling his services to the highest bidder as the ruthless assassin that never gives up and never misses," it continues. Deathstroke, a fan-favorite character, has appeared in numerous comics, animated shows like Cartoon Network's hit Teen Titans series and video games. He was portrayed by actor Manu Bennett on The CW's Arrow, briefly by Joe Manganiello during an end credits scene in 2017's Justice League, and was voiced by Will Arnett in animated film, Teen Titans GO! to the Movies.